Communities and volunteers across County Durham are being urged to take part in the eleventh annual ‘Big Spring Clean’ litter-picking campaign. 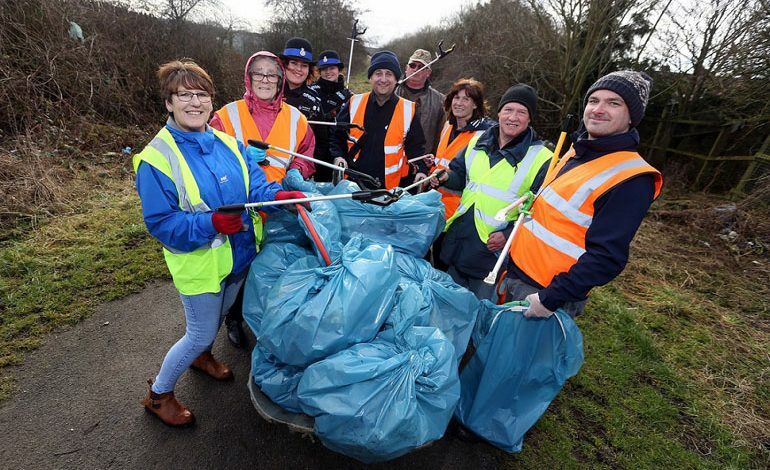 LitterFree Durham, in partnership with Durham County Council and Darlington Borough Council, is inspiring people to give their local area a spring clean-up to banish strewn litter in time for summer. The campaign brings communities together to tidy-up, clean-up or green-up their villages or towns and encourages thousands of people to make a difference. This year, the Big Spring Clean campaign will run until Sunday April 15 and people are urged to sign up and organise a litter pick in their village, town, or city in County Durham and Darlington. The campaign contributes towards County Durham’s priority of making the county ‘altogether greener’, and encourages residents to think about the environmental impact waste products such as plastic and metal can have on our wildlife, forests, and oceans. Representatives from Durham County Council’s clean and green and civic pride teams met with volunteer group ‘Our Place’, as well as PCSOs from Durham Constabulary, to launch the Big Spring Clean in Shotton this week. Speaking at the launch event, Cllr Brian Stephens, Durham County Council’s Cabinet member for neighbourhoods and local partnerships, said: “The Big Spring Clean campaign represents a fantastic opportunity for people to really make a difference in their community. “Last year’s campaign saw 191 litter-picks carried out in total, with 2,589 people contributing 3,382 volunteer hours to collect 2,865 bags of litter. All equipment, litter-picks and sacks will be provided to organised litter-picks and all rubbish will be collected and disposed of afterwards. In addition, the council’s Civic Pride team can advise on health and safety and risk assessments. Gerald Lee, Chair of LitterFree Durham, said: “So far we’ve been delighted with our annual Big Spring Clean event, but every year we aim to do better than the year before. “That’s why this year we’re urging more and more people to sign up and really make a difference to their communities. “Whether you’ve volunteered with us before or are new to it, we can provide everything you need to get started and even organise a litter pick of your own. “Never before has the public awareness about the evils of plastic been so great and yet whilst many are rightfully upset about our whales and dolphins being killed by plastic we should not forget that the same is happening every day on dry land – dogs, cats, birds sheep and cows are dying because we continue to litter our towns and countryside instead of doing what we all know is the right thing to do. Dropping litter is an offence under the Environmental Protection Act 1990 and currently a £80 Fixed Penalty Notice (FPN) can be issued to anyone caught dropping litter. The maximum fine for dropping litter is £2,500. To report litter louts online anytime visit www.durham.gov.uk/litter or to report litter incidents by telephone call 03000 26 0000 during office hours. To organise a litter pick in County Durham, email [email protected] or call 03000 26 0000. To organise a litter pick in Darlington, email [email protected] or call 01325 406 719. Visit www.durham.gov.uk/bigspringclean for further details.